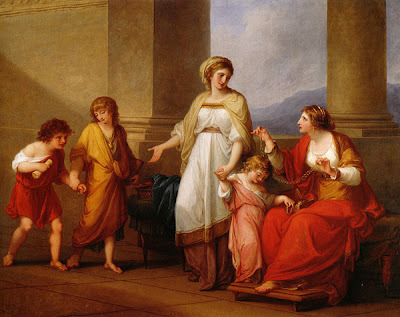 Cornelia, mother of the Gracchi (1785) by the Swiss/Austrian painter Maria Anna Angelica Catharina Kauffmann. As a women Kauffmann painted here a female heroine, Cornelia who was considered responsible for the education of her sons who became later very important politicians. very good painting .. and sure a classical mother!! Fairly heavy-handed moralizing, but a lesson typical of the times!